Engineering researchers at Michigan State University have developed the first stretchable integrated circuit that is made using an inkjet printer, raising the possibility of inexpensive mass production of smart fabric. The stretchable smart fabric was developed in the lab of Chuan Wang, assistant professor of electrical and computer engineering. And because the material can be produced on a standard printer, it has a major potential cost advantage over current technologies that are expensive to manufacture. The smart fabric is made up of several materials fabricated from nanomaterials and organic compounds. These compounds are dissolved in solution to produce different electronic inks, which are run through the printer to make the devices. 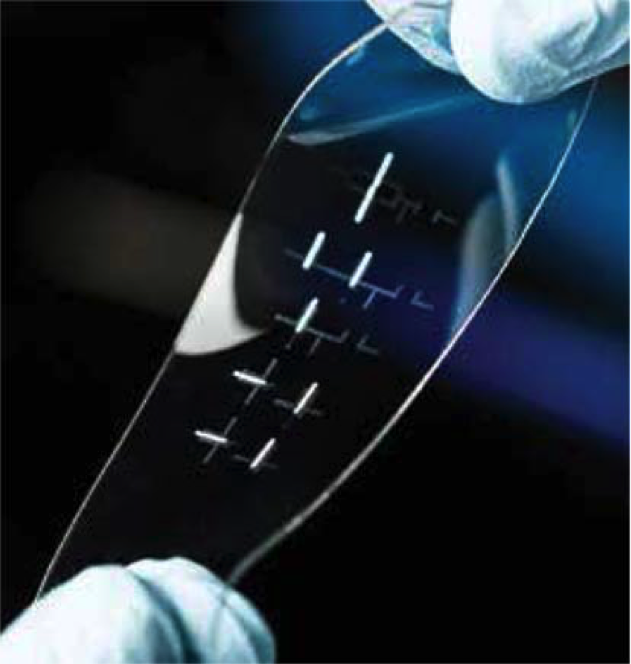 From the ink, Wang and his team have successfully created the elastic material, the circuit, and the OLED. The next step is combining the circuit and OLED into a single pixel, which Wang estimates will take one to two years. Once the researchers successfully combine the circuit and OLED into a working pixel, the smart fabric can be potentially commercialized. Conceivably, Wang said, the stretchable electronic fabric can be folded and put in one’s pocket without breaking. This is an advantage over current “flexible” electronics material technology that cannot be folded. The groundbreaking discovery of the ink-fabricated stretchable circuitry was published recently in the journal ACS Nano. Wang’s co-researchers were Le Cai, Suoming Zhang, and Jinshui Miao of MSU, and Zhibin Yu of Florida State University.